The evolution of the design capabilities, and consequently the quality of the products, is closely linked to the growth of the technological tools supporting the designer. The maturity of such tools is today at a level that permits, in some cases, their adoption in total replacement of experimental verifications. The aerospace industry world has always been pioneer in the research, the development and the use of mathematical models and numerical tools to build ever more sophisticated machines. The technological growth in other fields of engineering (automotive, shipbuilding, electronics, etc. ..) has often been linked to the capability to incorporate methodologies born in aerospace research environments. The availability of CAE numerical tools (Computer–Aided Engineering) has become an essential ingredient to compete in the market. One of the key points to win this competition, in all environments with high technological contents, is to invest in the development of design methodologies. The modern design philosophy is to go beyond the independent study of the various aspects of the design with the inclusion, in the process, of the effects of the mutual influences arising from the interaction of several physical phenomena (a typical example is the interaction between aerodynamics and structural deformations of a wing). These aspects were historically approached individually delegating the verification of the effect of their interaction to a final phase. The Inclusion of these interactions in the process represents a quantum leap with great potential. The next step is to develop a procedure that automates the multidisciplinary analysis process and includes it in a numerical optimization environment. The figure below sketches, as example, the procedure of an aerodynamic CFD–CSM optimization (Computational Fluid Dynamic – Computational Structural Mechanics), which includes the effects of fluid-structure interaction. 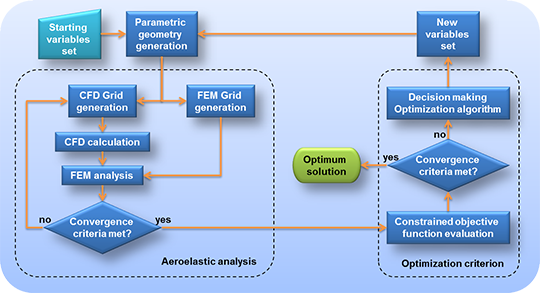 The design strategies based on multidisciplinary numerical optimization represent, in the aerospace field, the “state of the art” of engineering design methods. They, however, require to include several skills and methodologies in the same environment. The designer must, therefore, have high expertise in all the disciplines involved in the design procedure (CAD, CFD, FEM, numerical optimization…). Design Methods is specialized in the creation of design tools based on CAE software integration, in the multidisciplinary numerical optimization environments development (single and multi–objective), in codes coupling, in the definition of geometry parameterization procedures and in the identification of appropriate optimization strategies. Link to case studies on aerospace, automotive and marine fields.